The economic calendar is light this week. Following the October’s Jobs Report, Stock market moves may hinge on any inkling from the Fed that the time has come for a hike to its benchmark rate. Economic data releases start Thursday with weekly Initial Jobless Claims. On Friday, the Producer Price Index, Retail Sales and Consumer Sentiment Index data will be released. 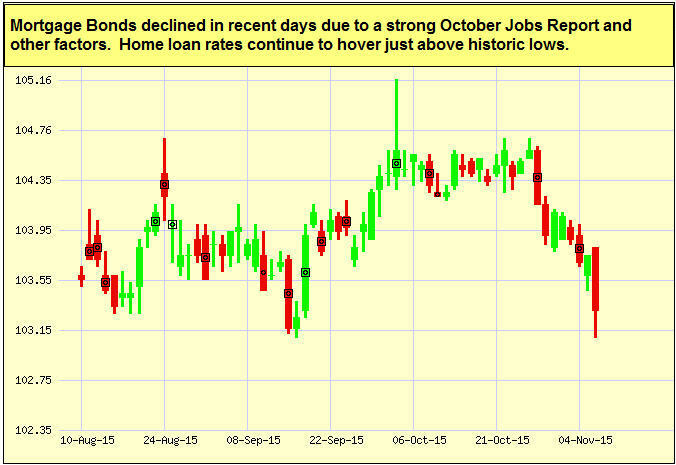 As you can see in the chart below, Mortgage Bonds were clobbered following the positive employment news. Despite this, home loan rates remain quite attractive for home purchases or refinancing. They micromanage your work. If your work is thorough, a micromanaging customer can be frustrating and force extra work on your part with unneeded follow up or additional documentation. Gentle reminders about the process, expectations and your expertise will help. They don’t value your opinion. Lack of trust is fatal to all relationships. When customers don’t take your expert advice seriously, address it. Clarify what they want from you by asking them calmly and candidly. They don’t respect your time. Frequent lateness or “no shows” for meetings, appointments or calls is disrespectful to you, your team and your other clients. If possible, bill them for the time. Have clear scheduling policies that you share. And if clients routinely show up late, remember to still end on time, letting them know your next appointment is waiting. They always haggle price. If you do great work and give lots of value, there should be little to discuss about your fees. To be safe, always discuss your fees up front, so there are no surprises. You just want to avoid them. Life is too short to spend time with people you don’t like or who don’t seem to value your time and expertise. Set clear boundaries and expectations, and communicate them often. If you decide it’s time to let your client go, schedule a face-to-face meeting to explain why the relationship isn’t working and discuss options that might be a better fit for them. Remain professional. If you have a contract, make sure you fulfill the terms.